As you know, we really want to rebuild our fireplace so we thought we’d go ahead and flip the room to be oriented toward the one-day mantle. 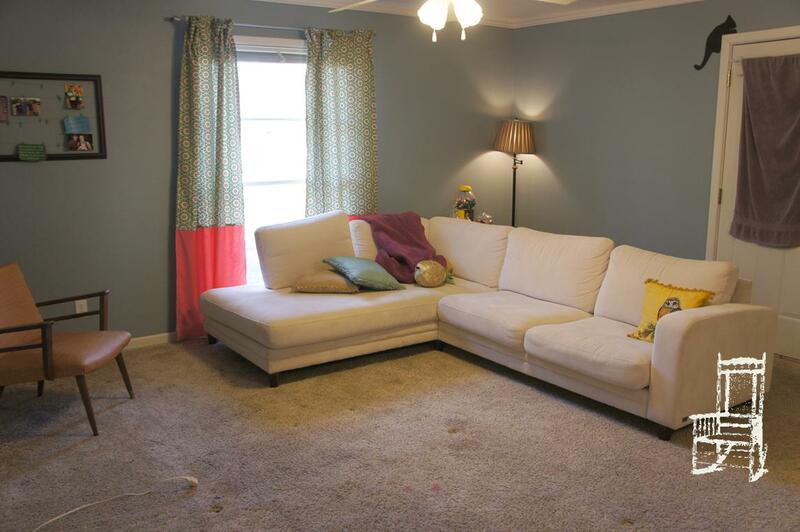 We began by clearing out the TV from the back corner. . .
. . . and flipping the couch around. I was instantly in love! 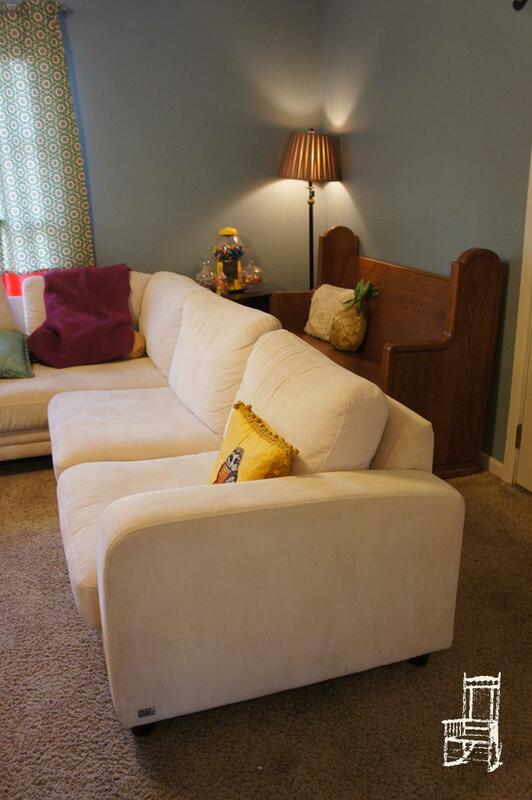 We added 1 pew behind the couch and nestled our candy bar between it and the wall. 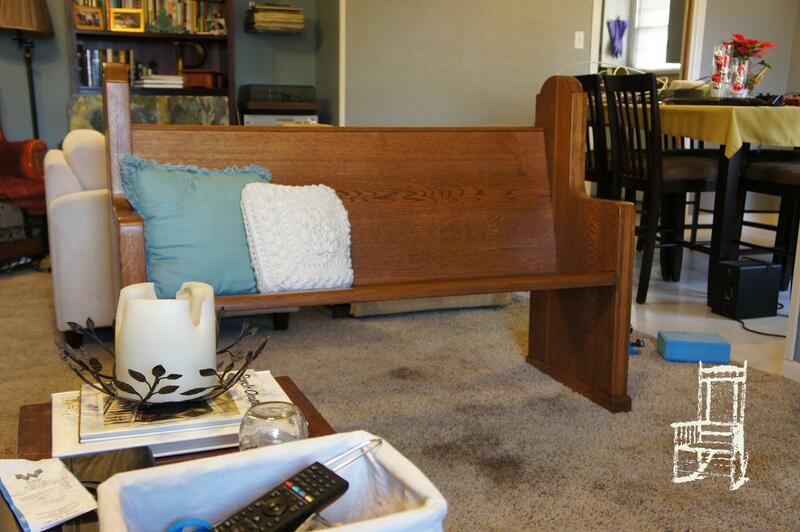 The 2nd pew went perpendicular to the couch to separate the living space from the dining/reading area. I was planning on making a cushion for each pew but I have to admit – they’re really comfortable as is! 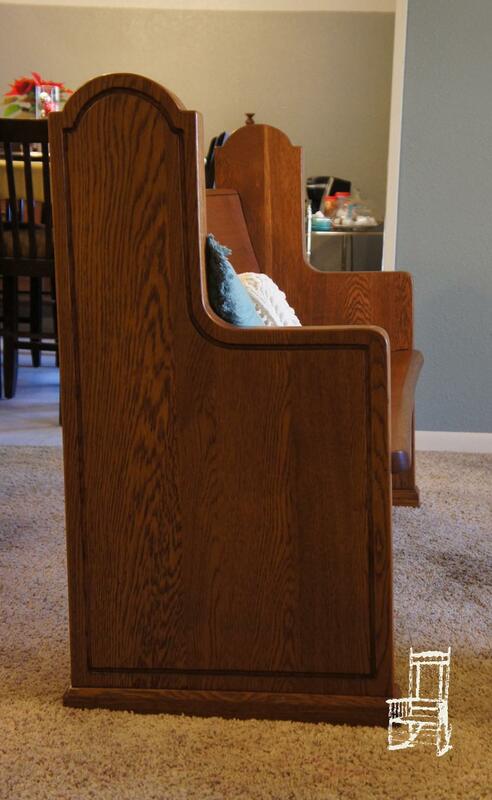 You can tell that these pews were likely in an auditorium with a slanted floor so now that they’re on level ground the seat back is almost reclining. 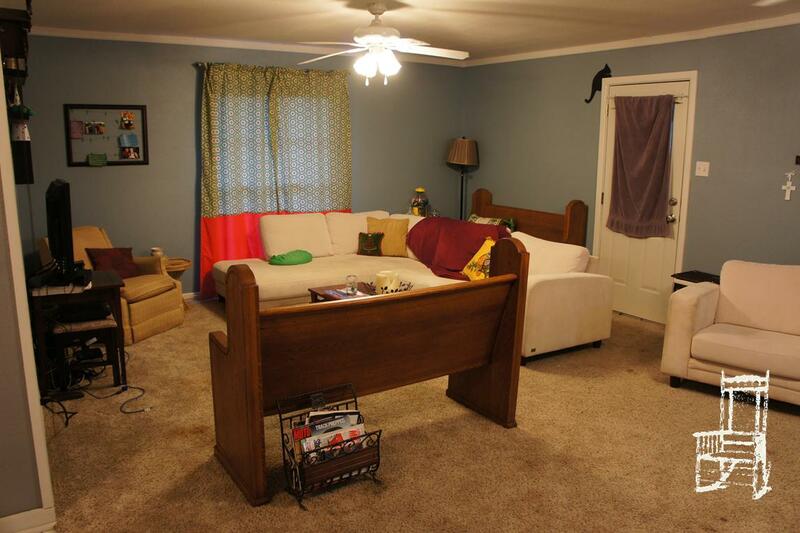 After some more arranging and a little staging, here’s what the final product looks like! What do you think, love it or hate it? 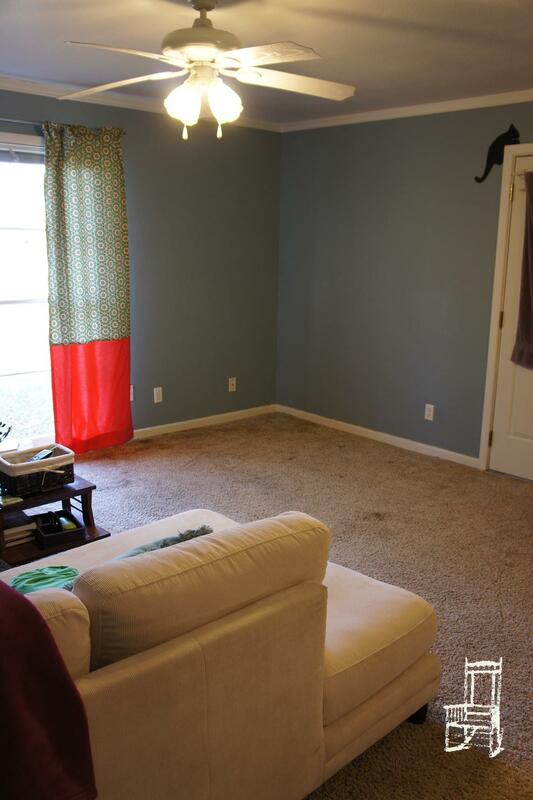 PS – maybe one day I’ll make an actual curtain for that door and take down that nasty curtain. Maybe. We can only hope. During our recent Florida vacation, I was able to spend a few minutes thrifting in local junk shops. One of my favorite stops is Our Timeless Treasures (formerly, The Pack Rat) just south of JAX in Keystone Heights. 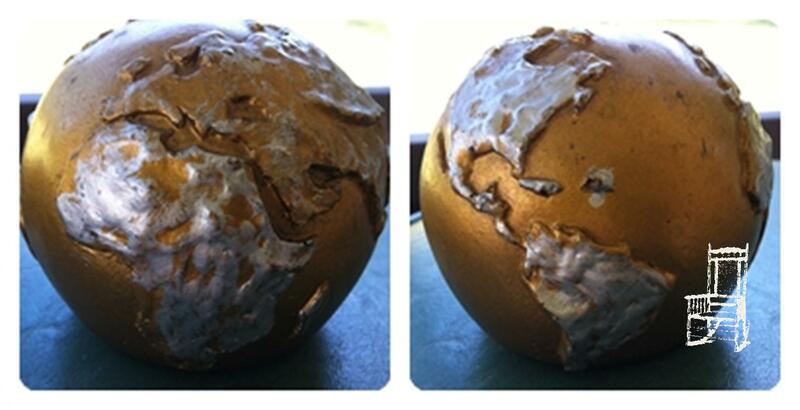 On this trip I picked up this globe paperweight for my growing globe collection for just $2 (an update is coming soon!). 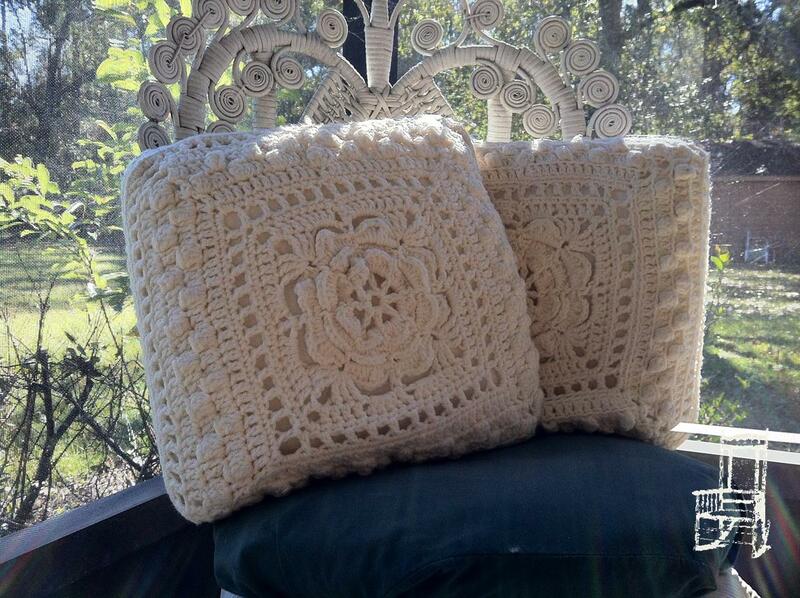 We also made it out to one of the JAX ReStores where I found these 2 handmade throw pillows. I’m pretty sure they’re going to find a home at my new eat-in kitchen. That is, after I finish painting and staining the bench. . . but I digress. 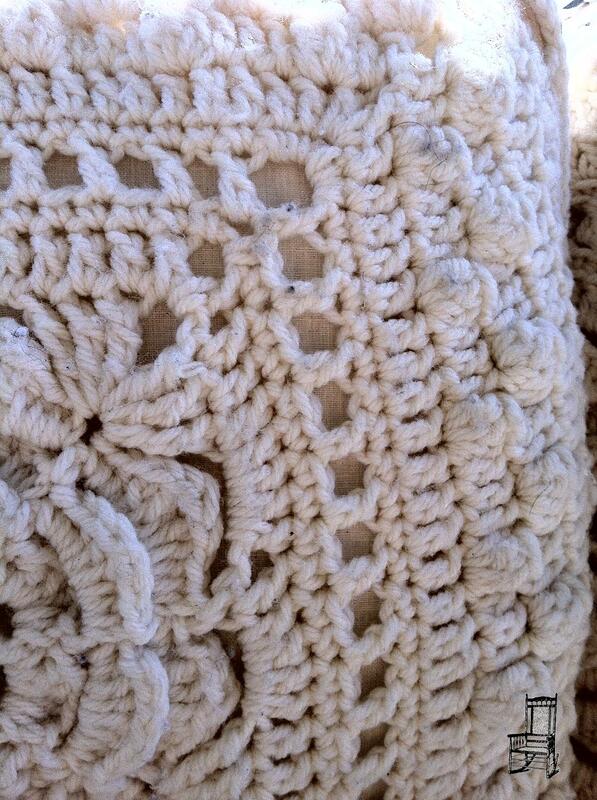 I’m always a sucker for intricate knitting. My biggest find of the trip came when I wasn’t even looking, in fact I didn’t even find it! 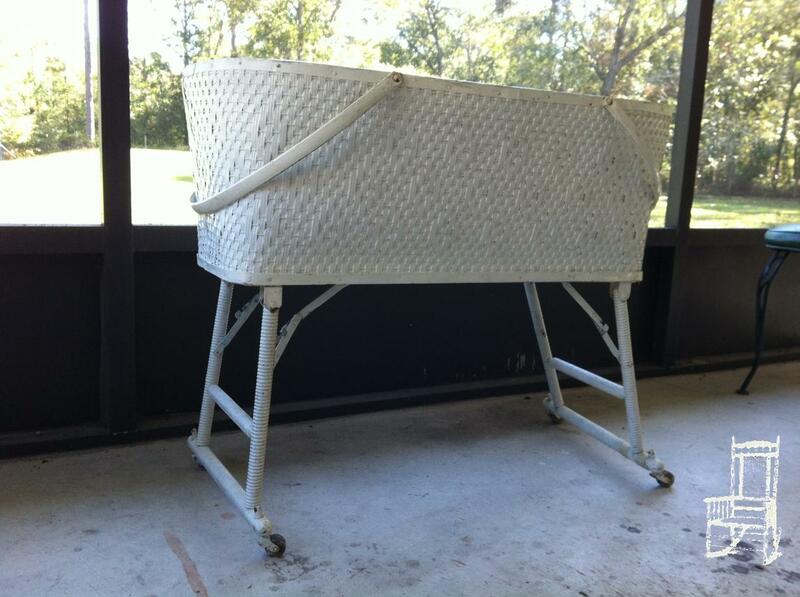 Phillip’s mom found me this vintage bassinet and the best part was the price – free! Granted, I have no plans to use this bassinet any time soon so if anyone wants to borrow it let me know! 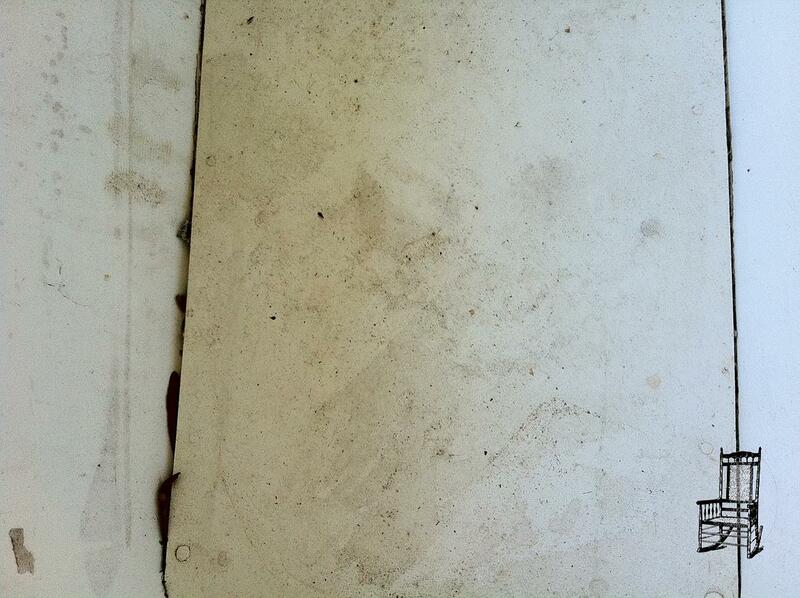 I’ll give it a good scrub down and make a mattress for it, it looks like it has years worth of dirt and grime. Did you come across any good finds this Thanksgiving? 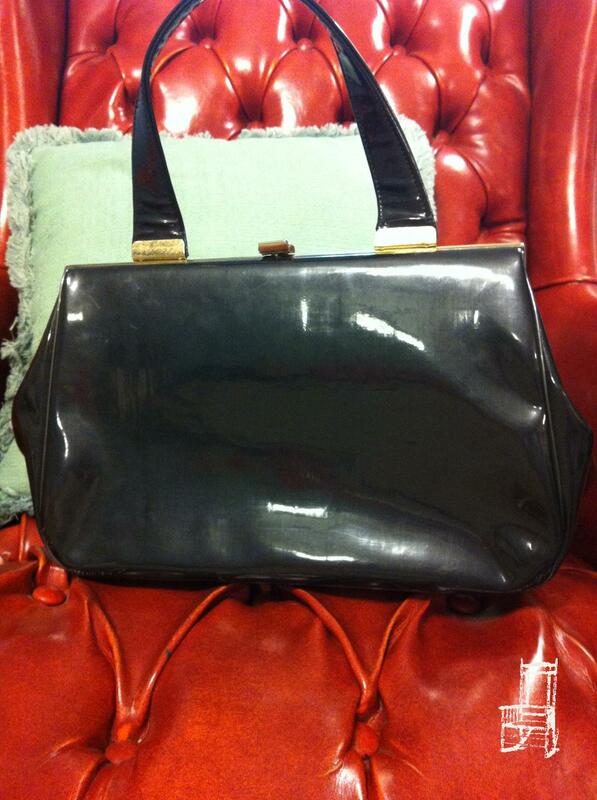 As always, I found some great pieces at the fall My Sister’s House Sale that I just had to share. 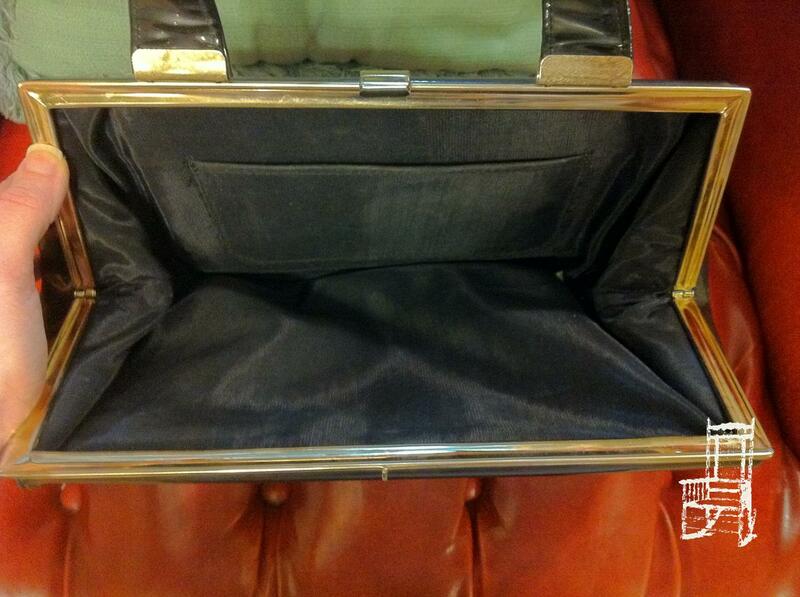 Lots of great clothes were found but my favorite find of the sale was this vintage black clutch. The inside is in great shape and you wanna know the best part? I found it on discount day which means I paid a grand total of $2. TWO DOLLARS. This might just be my find of the year! My second great find is a bit more. . .functional shall we say. 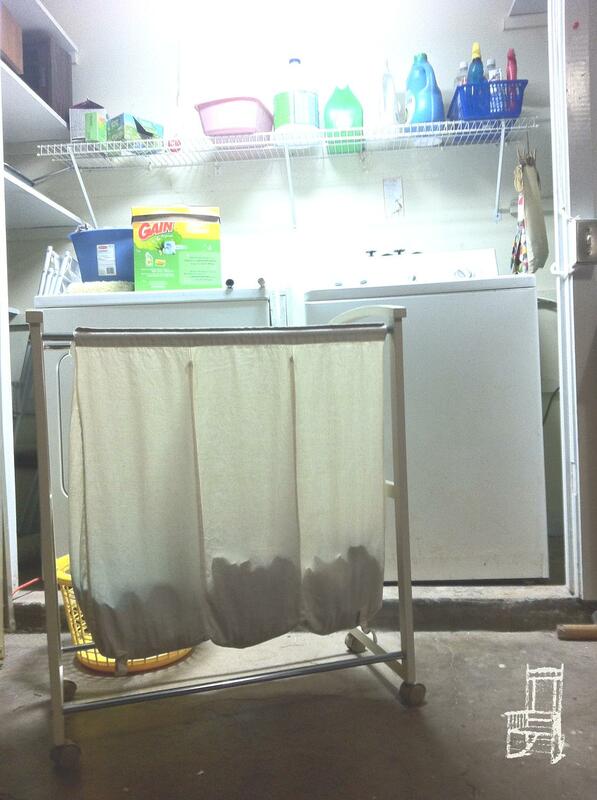 You may have noticed that I’ve never mentioned my laundry room. . . that’s because I don’t have one. Yeah, my washer and dryer are in the garage. Gross. As luck would have it our master bath happens to be the farthest point in the house from the garage and thus I am constantly walking back and forth with laundry baskets. It’s so annoying to only be able to carry one load at a time! But back to the sale. 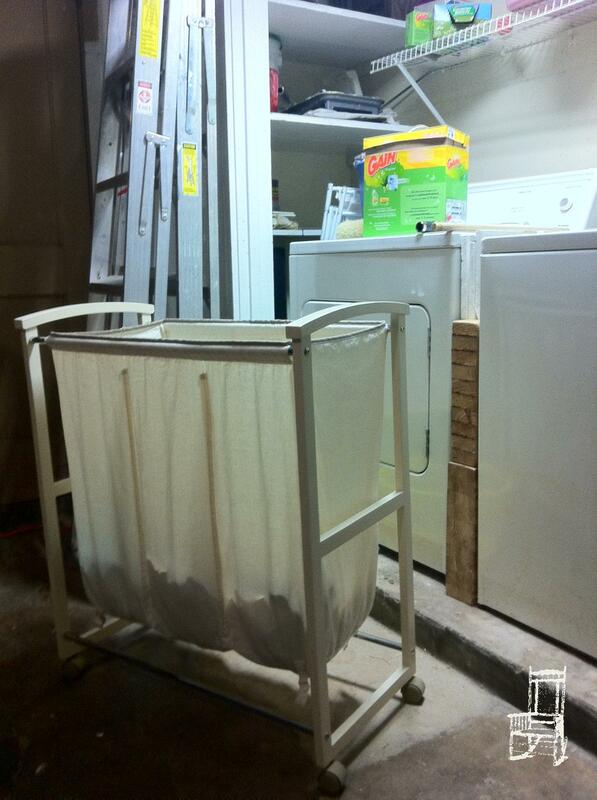 When we were dropping off our items I browsed through what had already been dropped off and I spotted a rolling laundry cart. And it was only $10. Holla. I got in early this time with my volunteer pass and luck was on my side, there it sat in the corner waiting for me! 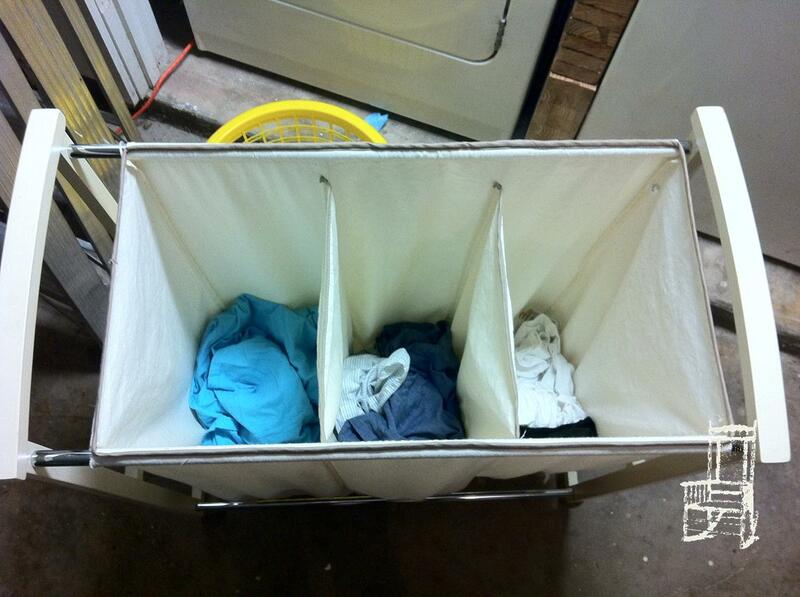 I snatched it up, brought it home and it has drastically improved my laundry process! I fill it up with dirty clothes in our room, roll it to the garage, wash the clothes in loads and when everything is dry I roll it back to our room to be folded and put away. 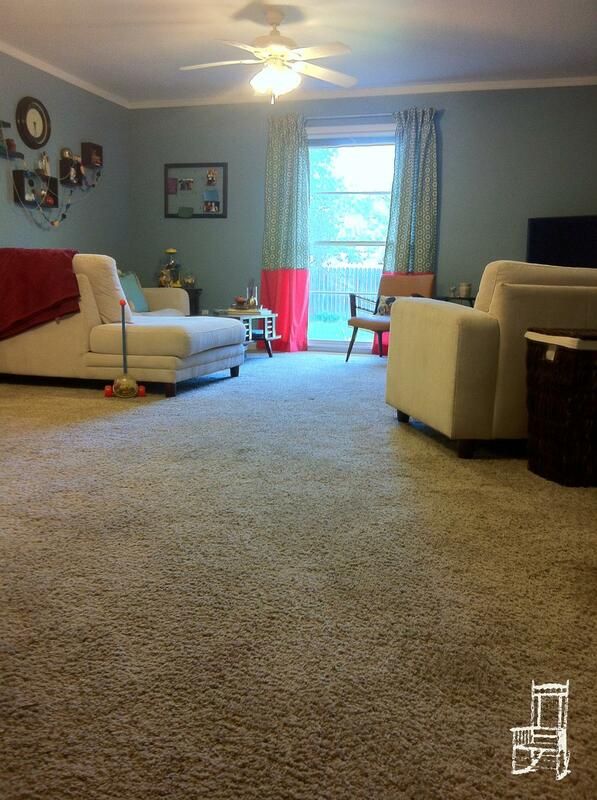 Who knew such a small change could make such a big impact?? Now please hear me say, I’m all for being organized simply for the sake of being organized. My world is much better when everything is orderly and neat but organization for the purpose of making my life easier? Sign me up! Thanks Kate and Summer for putting on another great sale! Can’t wait until the spring sale!